So what exactly happened with the detached housing market in September? Bare with me as I write this report from my hotel in Mexico. I’m currently on a one week sabbatical, I had to upgrade the wifi just to get speeds even remotely close to back home. Disclaimer, no tequila was consumed during this analysis. The Vancouver real estate market is incredibly volatile right now. With new policies being announced on almost a weekly basis, such as the empty homes tax, and the new policies around Airbnb. As the market continues to change on essentially a weekly basis, it’s critical you take all stats with a grain of salt. Numbers can be up one week, and down another. What’s critical is that you look for the trends. I discussed this in my post What is Happening to Sales Prices in Vancouver? Although detached numbers look rather grim, they have rebounded since my early report September Sales On Pace for Record Lows. However, I wouldn’t write that post off, the stats below for months end are not much better. For a quick comparison, this was the fewest sales in September for Vancouver East on record (last 10 years). For Vancouver West it was the fewest sales since September 2008 when there were 46. 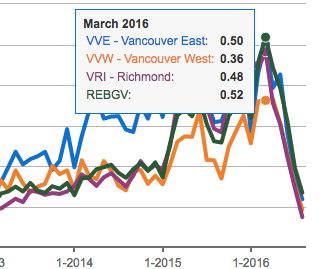 For REBGV (Metro Vancouver) this was the fewest sales since September 2012 when there were 596. So how about new listings you say? The counter argument is that sales are down because inventory is low. We all know low inventory didn’t hinder the market from hitting record sales earlier in the year. But I digress. New listings are up across the board. Except for Richmond and Burnaby which remained the same as August. Month over month Vancouver East is up 15%, Vancouver West up 23%, REBGV up 14%. Sales to actives ratio continued it’s downward trend. Which in my opinion is a very good metric to use when gauging the market. As per the board, anything under 14% is considered a buyers market. Anything over 20% is a sellers market. So all areas are in what’s considered a buyers market. Which begs the question why we are still seeing people in multiple offers? Crazy. For comparison here’s the sales to actives ratios back in March. It’s been falling ever since. Again a buyers market in all areas for detached. Prices are hard to gauge when using both median and average sale price. Again, like I mentioned in a previous post, detached prices are down roughly 17% over the last several months. I’ll try to dissect this further in another post. To summarize, prices for the most part are up slightly from August. Prices take time to adjust. Whether it happens for sure is anyones guess. I could sit here and throw stats and numbers at you all day and you could analyze them until you’re blue in the face. Here’s the quick and dirty. It was another slow month for the detached market in September. Many pundits predicted a turnaround after a disastrous August, well, it didn’t happen. The market also didn’t go completely belly up. For the most part, September was awfully identical to August. September started out as a very ugly month and slowly rebounded, somewhat. We still set record low sales in some areas. Price reductions are piling up, and the market showed no real signs of a turnaround. What happens in October is anyones guess.